“It starts with spirit. Team Ace Racing believes in team spirit, drive and sportsmanship. It’s this combination that makes for a winning team”. To really appreciate how one encounter from a drag racing legend ignited Harold Parfett’s passion for drag racing let us go back to that fateful day in 1966. My introduction to racing began in 1966 when I was 15 years old. I was baling hay on my Uncle’s farm when my friend Doug drove into the field to let me know that he could use his Dad’s car on Sunday. We decided we’d drive into Edmonton and go to the drag races at Edmonton International Speedway. I was thrilled at the idea of seeing real drag race cars. So that Sunday four of us headed out for the hour drive to Speedway Park. I remember getting out of the car to the sounds of the roaring engines. As we went through the pits, there was a large group of people around one dragster in particular. We were several rows back in the crowd and I could not see who the driver was. A total stranger turned to me and said, “That’s Don Garlits!” As we worked our way through the crowd to get closer, Don suddenly spoke, saying that he had a signed picture to give away. He pointed in my direction and said, “Hey Kid”… and I thought that could never be me. But he was looking right at me. He said, “Yes you there, come here.” He shook my hand and gave me a picture and I was just overwhelmed. I froze on the spot. Don finally said, “Got any questions?” I said, “I think it would be amazing to own a race car like this. He then looked me straight in the eye, tapped me on the right shoulder and said, “Kid, if you work hard, I guarantee you will own your own race car.” My life changed after hearing those words from Garlits. Even then, Garlits was a legend. Two years before, he had achieved the first of his three greatest accomplishments in the sport of drag racing. Don Garlits was a true champion and by all accounts a gentleman. His Swamp Rats were beautiful, strong and simple. Don wasn’t flashy or full of himself. He seemed to be just like anybody else. Except he wasn’t. He was a man who moved the sport of drag racing with him. Through his developments and experimenting, and by always charging forward, the sport followed him…just like all those eyes did in Edmonton back on that special day in 1966. Fast forward eleven years and I’m now 26. That year I left a good stable job and decided to start manufacturing electrical boxes in my garage. It was a big decision. The business, ACE Manufacturing, was a struggle initially. There was no spare money for that race car Don said I could achieve. However, as time progressed, the business grew stronger and we made a little more money that we could put aside. It was not long before local racers would come up to my shop and ask if I would sponsor their race cars. My thinking was while I could not afford to run my own car, I could help other struggling racers. Sponsorship connected me to racing. The only thing I wanted to see was how badly they wanted to win. If their desire to win was there then I would help them. In 1990, we formed Team Ace Racing. Eddy Plaizier raced his now famous 1948 Anglia in super gas, Frankie Plaizier with the dragster races in super comp, and Casey Plaizier ran the junior dragster. This gave us a great start to a family orientated multi-car race team. Kevin Boyer joined with his drag bike, that has now lead to a championship nitro Harley a 205 mph 6 second rocket. In 2004, we added a 1937 Chevrolet nostalgia funny car to the mix, and in 2006 a 1953 Corvette funny car bought us to a six-car team. Over the years, we have won a lot of races and thrilled a lot of fans. Many of the accomplishments Team Ace Racing achieved could not have been realized without the learnings of building a successful manufacturing company. 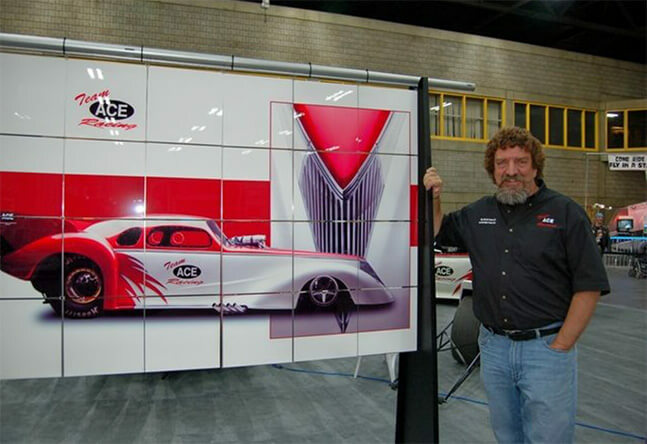 The parallels between crafting winning drag racing teams and manufacturing electrical enclosures are similar in process. Every building project is a puzzle with multiple solutions available. Good builders make smart choices in terms of materials and design. It’s that natural instinct combined with curiosity and the craftsmanship and expertise that go into custom fabrication that really set a winning project apart. That mix is the secret to producing high quality products and high-performance vehicles. Team Ace Racing, with the cars we own, teams we sponsor, racetracks we support and my mission to preserve history through my personal racing museum is what makes my connection with drag racing so memorable and meaningful. From that first meeting with the legend to the next up and coming drag racer, I am proud of Team Ace Racing’s past accomplishments and its purposeful future.